The CUSD Rally is just around the corner … be sure to wear #REDforED as we come together as a district! If you ordered a shirt and had CEA pick it up, be sure to stop by the CEA table at the Chandler Center for the Arts to pick up your shirt so you can wear it during the rally. 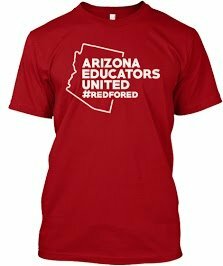 Even if you don’t have an official #REDforED shirt, we hope you’ll wear something red to to show your support! Please plan on arriving to the rally at least 15 minutes early to line up along Arizona Avenue and march into the rally wearing #REDforED. This will be a powerful statement to our community, including local media.